MAC addresses can also be used for less nefarious purposes. For example, if your iPad is stolen on a university's campus, the IT department may be able to use its MAC address to trigger an alert when the criminal connects your iPad to a university network. For reasons like this, it can be a good idea to find and store your iPad's MAC addresses. Tap About. The window shown below appears. 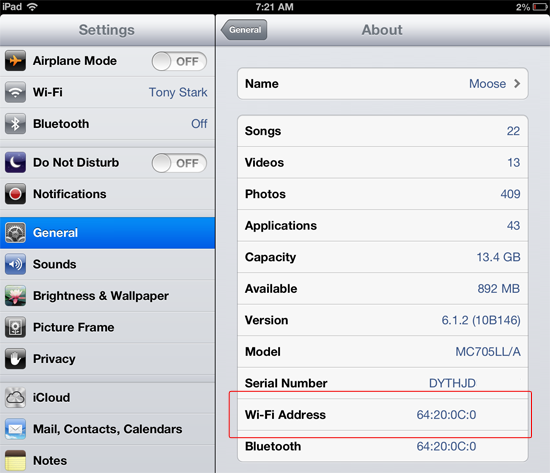 The iPad's MAC address - referred to as the Wi-Fi Address in iOS settings - is displayed on the screen. This is important: You should not share your MAC address with anyone except authorized IT personnel. MAC addresses are unique and permanent, but they can also be spoofed by attackers. In a worst-case scenario, a malicious individual could acquire and spoof your MAC address, and you could be blamed for the illegal activity conducted by the malicious individual. So please, protect your MAC addresses!